That's really all you need to have a good time on a DH stream. I was turned on to white buggers by a friend that I fish the Neuse with. I never was a beleiver of using Wooly Buggers. I decided to try them a few times on a DH stream and now they are a must have in my fly box. 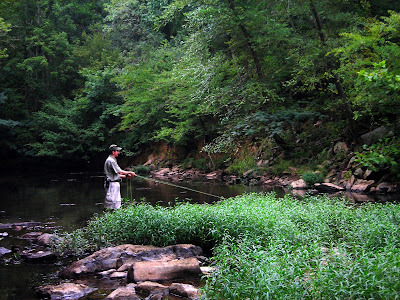 The day on the Watauga was one of those perfect days you can script out but rarely get. No crowds, sections of river all to myself and plenty of fish. 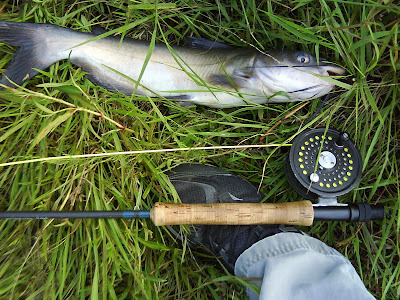 The water was gin clear flowing at a perfect rate, the fish were feisty and eager. On my second cast I was hooked with a nice brookie. 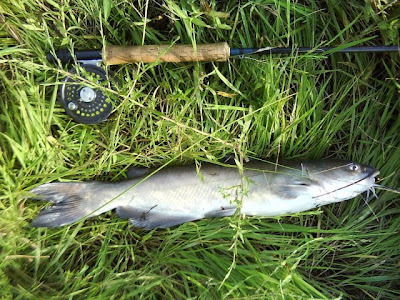 Sometimes that is a bad omen, if you catch a fish that quickly it's usually your only fish. I figured I'd try this section on the other side of a huge pool I was working. While ducking under a log I managed to soak my pack. Right after I remembered my cell phone was in the pack. It was wet but not drenched, the screen still had a display and it seemed to have survived. I took some more pictures through out the day and caught some beautiful brookies. They didn't have much fight in them, but what they lacked in vigure they made up for in displaying various fall colors. They had and orange tint to them with bright white stricking lines on their fins. One brook was probably the prettiest I've ever caught, obviously displaying spawning colors. I took a picture but it seems my wet cell phone was messed up enough that the pictures didn't take. I was able to get a pick of a nice brook before the dunking. I fished for about 2hrs and it was one of the most productive days I've ever had. I caught nearly 20 fish and at least missed that many. The last fish I caught was on a dry and that was icing on the cake. The water was so clear you could see the trout swimming and how they behaved as they chased a bugger. It was one of those days you dream about. Experiences like this keep you coming back and make up for the ho-hum skunk days. Fished the pond by my work and the ones close to my house. Bass are still holding shallow. I have gotten a few on the gully fish. I walked around the pond at work and saw a something that made me extremely happy . A CARP! It was cruising the shallows. I saw it again today and it was tailing pretty good. I threw a nice bead headed bugger at it. My line twitched, I wasn't sure if the fish was on. I put some tension on the line slightly the fish slants and then bolted. I think it spit the fly just as I was putting tension on the line. I didn't see the carp again and had to resort to catching feisty gills. 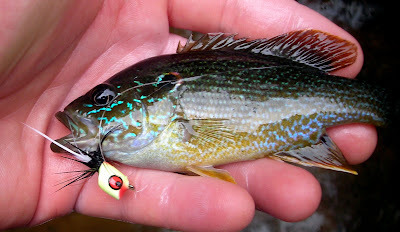 I also with the help of Preston classified bluegill as the most agressive fish. I used to think bass were very agressive. It's been my personal experience that bass are pretty lazy. Trout are more aggresive than bass. Maybe bass are smarter, I don't know but they haven't been the easiest fish to catch this year. Especially the larger ones. The Smallie Trip is next weekend and I plan to have lots of pics for that report. I also hope to have a carp pic. Another delemma I have is figuring out whether to fish a certain pond or not. The sign says the pond is for residents only and the fishing is catch and release. I fit one of those criteria. Usually something like this wouldn't bother me, I'd just fish and not care. But I know how I get when someone fish's the pond by my house and I can tell they are not a resident. The pond by my house is for residents only as well. I don't really get mad and tell them to leave but I kind of feel like they are taking advantage of me. It's strange, it's not my personal lake. I guess I just feel I pay to the HOA that maintains it so in a round about way it is mine. I'm explaining all this to justify why I'm feeling a little guilty about fishing this other pond. I may fish it again but not for awhile. I really do take posted places seriously. Trespassing is not only againts the law but it is disrespectful. Or maybe this is normal bass behavior and I've just never seen it before. The nights have been getting colder, but the daytime average temperature has been in the 80's. I went fishing at a local pond by my house at around 8am. I was trying the gulley fish for the first time. After the second cast I had a little bass on but he came off quickly. While I worked my way around shore I saw bass here and there, then as the sun rose higher in the sky and I could see further into the water I noticed something strange. I've seen bass hold close to shore, but never this close. The shoreline was outlined with boulders to protect it from erosion. The bass were literally in the crevices of the boulders. Sometimes there would be a small school of 5-6 bass in inches of water. Just enough to cover them. I can only imagine they were getting into the warm water. Later in the day I saw some cruising, at one time there was a school of 20. I cast my gulley to them and they scattered in all directions. I gave the gulley a twitch and I saw a shadow dart from the side to inhale it. It was my first fish on the gulley. I was surprised by the take, if I was further away I'm not sure I would have seen the fish take the fly. Or been in a good position to set the hook. 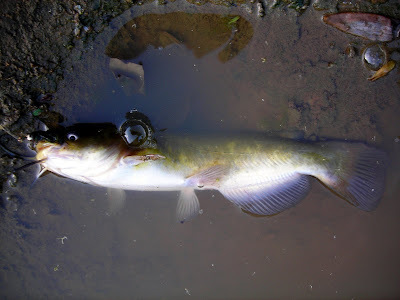 I hunted more bass along the shoreline and had many more hits and misses. The fish just weren't super aggressive. The gulley might have been a little to big for them. Right before I left I saw some more bass cruising. I cast again and they disappeared. Made a twitch of the fly and a shadow slowly rose to the gully and GLUMP! The fish was caught. I'm looking forward to trying this fly some more. I can't say it works better than a popper or other flies. But I can see why it works. I also can't wait to try this pond again. It seems like the perfect place for my favorite type of fishing, sight fishing. I have some friends that are somewhat new to fly fishing and I've been filling them in for months on how great the Eno is. They decided to accompany me this morning to see if the reputation is deserved. I tried going to a place that I went a few weeks ago. I couldn't find it and after a few twists and turns we ended up on a section I've never fished before. The parking lot was small and the place didn't look like it see's too much action. I wasn't sure if that was good or not. Jen headed down stream, while Claudia and I worked our way upstream. It wasn't long before small fish started to play with the flies. We were using poppers and I imagine the fish were small or they were fisherman wary bass. The bass in the Eno have a skill of swimming ever so gently up to your fly and kiss it with the slightest touch. I had a few decent hits but I couldn't seem to hook anything. As we moved up stream I saw a spot that looked promising, made my cast and had a fish take the fly almost simultaneously with it hitting the water. The water was so clear I couldn't tell if it was a fish or what. It was a strange view, it almost looked like my fly was being dragged around beneath the surface by an invisible force. I set the hook and saw a nice green flash. I figured it was a roanoke I became excited and really tried to work the fish. As it swam in front of me I could see the big blue mark on it's gill. The signal of a bluegill. My mind had a hard time processing this, because this fish was bigger than any bluegill I have caught before. As it came closer it seemed to get even bigger, it didn't fight that much until it was about a leader length away. Then it was a project landing the fish. I really needed a net. I usually don't catch anything that requires a net in the Eno but this was an exception. I finally wrapped my hand around the fish's gut and pulled it out of the water. It was a thing of beauty. This was by far the biggest sunfish I had ever seen. It was a really healthy fish. This fish was wide as it was tall I did some research and found this fish is a red eared sunfish alos called a shellcracker. After releasing the fish I tried around the area where it was caught. Nothing else even sniffed my fly. Claudia and I decided to check on Jen. Right as we walked up Jen was pulling in a little sunfish. She had caught quite a few and found a honey hole. I had Claudia work the back of the hole to see if she would have luck there. It wasn't long until she had a sunfish of her own. The fishing slowed down a lot. The water seemed to get shallower. I decided to be a good samaritan and pull and old raft upstream that was deflated and draped over a tree. While dragging it back I kept asking myself why I picked it up. The raft was really heavy and waterlogged. We all had a really good time exploring the area and catching some fish. The Eno never disappoints. This is probably my favorite place to fish in the Raleigh area. 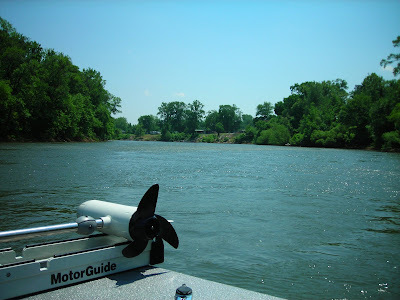 I'm going to hit this river again in a different spot next month. My week of vacation first started out with me forgetting my pack at Lake Crabtree. I thought it was never going to see it again. I had to pick up my mother from the airport and the lake was on the way so I decided to swing by and see if I can get a miracle. Well god had one in store for me because as I walked to the waterfront I could see a blue through the grass of my fly box. I then saw my chest pack lying on the beach by the canoe launch. It was virtually out in the open and all of my gear was untouched. 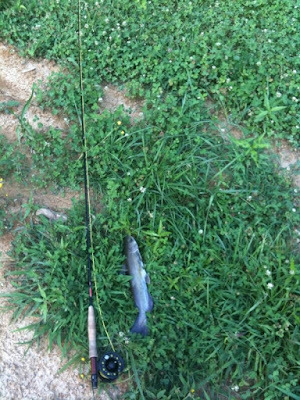 I decided to press my luck further and fish the same spot I had caught a catfish the day before. 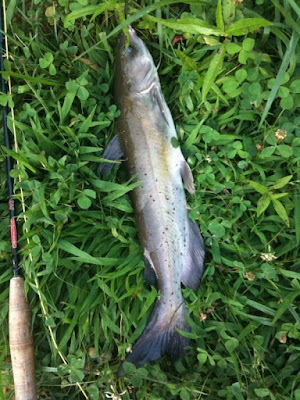 I lucked and hooked up with another cat using the same fly. I didn't have time to keep fishing I had to leave and pick up my mother, but it was a great day none the less. I went to Galax, VA to visit family and was able to check out the Little River and Little Stoney Creek. 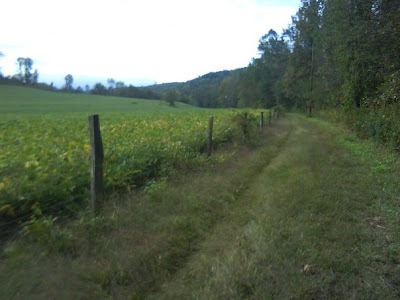 My cousin owns some land by the Little River. It is a beautiful section and my cousin said there are plenty of smallies and rock bass. I got in the water and worked my way upstream. I had plenty of good chances and holes that looked promising but I didn't get any bites or see any action. Things got worse as a family decided to tube down the river right in next too me. I couldn't blame them, the day was amazing and if I could I have I would have done the same. My mother, wife and I checked out Little Stoney the next day for a hike. Once we were a decent distance from the parking lot I started to work the water. This was short lived. After about 10 casts I heard a loud thunder clap and I knew my time was limited. We made haste and went back to the car. I pretty much realized when on vacation with family the fishing opportunities are hard to accomplish. Time with family is more important but I was happy to get the short amount of time that I did on the water. 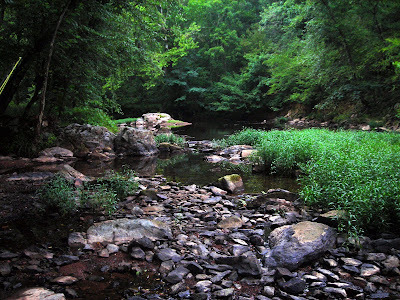 I hope to hit the Eno next and have a report of catching a Roanoke Bass. The carp have been shy lately. I haven't seen them in the pond by work in a month or so. I tried my luck today and was able to catch some gills and little bass. The gills were decent size a little bigger than my hand. The picture really doesn't do it justice. The color on the gills out of this pond are beautiful. I think it's because the water is really clear. Later I met a friend at Crabtree Lake, I had never fished there before. The water looked really good and you could see rises in all direction. I went with a popper first but didn't have much luck. I decided to try a big bead headed brown bugger. I worked one section then went to a nice eddy. After a few cast I latched onto this guy. The take was pretty ferocious. The fly was only in the water for seconds before the fish hit it. I thought maybe it was a carp because it took line instantly. As I started to fight it more I realized it was a cat. The fish in this lake are supposedly unedible due to contamination from hazardous waste dumping in the past. I think this fish is a good indication the fish population might be bouncing back. It looks pretty healthy. Sam gave me coordinates to where the Roanoke's were supposed to be. We decided to try some water he hadn't fished much first. 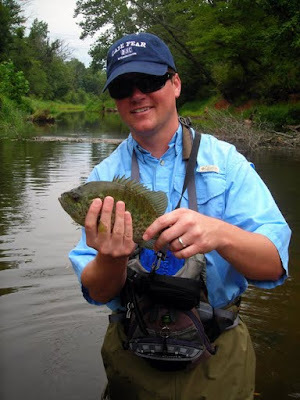 We worked pockets here and there and it wasn't long until we caught probably the most prevalent fish in the Eno.. Sunfish never get boring, when you think you've seen the prettiest one you'll catch one even better looking on the next cast. This river has to be the best sunfish river in North Carolina. It is great for beginners. The fish are feisty and they almost always hit top water poppers. The action is exciting. 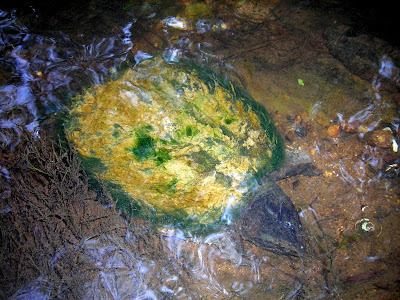 We found one pool were I found a pod of sunfish under a tree. I caught a fish on almost every cast. The strikes varied from a sip, inhaling, to a rocket launch accompanied by water and a glimpse of fins as your fly disappears. As we waded there were tons of dragon and damsel flies. Minnows jumped here and there, probably escaping roaming bass. While working some of the pockets that Sam recommended I wasn't able to catch a Roanoke. I decided to take some pics of him fishing because often when you go fishing you never get pictures of yourself. I went to tell him do some false casts so I could get some pics and in the middle of my comment.... Fish On! After a few seconds Sam says "It's a Roanoke!". I couldn't believe it, I was just fishing in that same spot 5minutes before he got there. He was able to land the fish and show me what the fish looks like. This was a nice fish and you could tell it had been eating well. The fish looked just like the rock bass I've seen in Virginia. I was really excited and eager to catch my first Roanoke but it was not in the cards for me. 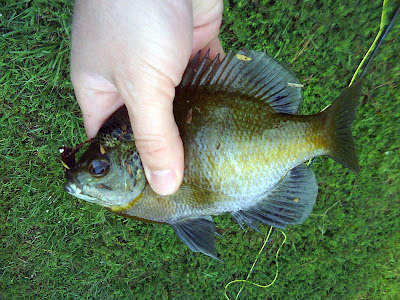 I was still happy to catch sunfish. The experience made me eager to get back and go for the Roanoke again. Sam is great fishing partner and I look forward to fishing with him again. On the hike back upstream, Sam almost stepped on a moving rock. A good size snapping turtle. About the diameter of a basketball. Not something you'd want to annoy. That's the fun part about fishing you'll always see other wildlife, turtles, insects, birds you rarely see anywhere else. It's hard to come off the water after days like this. Fished at a buddy's pond tonight. Caught a few gills and this guy on a san Juan worm. He gave a pretty good fight. I guess I never will learn from past experiences. What I have learned recently is when I think something is not a good idea it probably isn't. An example, I had a reel that has a broken crank on it. I've been just using my palm or finger to reel in line. I decided to finally remedy this. I wanted to switch the line from one reel to another, so I started stripping it off, I got impatient and started just bundling the line all over the back of my car. While doing this I thought "this isn't a good idea", but kept doing it. Then after wards I looked at the birds nest of fly line and forgot about it. This weekend in Boone I wanted to go fishing but needed to put that line on my other reel. The ball of tangled fishing line was intimidating but I started to work at it. It was HORRIBLE! The whole time I fought with it I thought, how did I let the line get like this? and I should just cut the line here and start over. I spent an hour untangling and stripping one peice trough the mess of tangles. I would slowly get a few feet of line as a reward each time I removed a tangle. I did this for about an hour. I got all my gear together and made my way to the Watauga River. 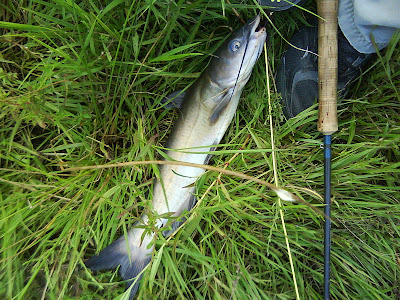 The river was stocked the week before and I was sure it had been poached plenty but had to have a few trout left. When I got to the river and started to put on my gear I noticed my boot didn't look right. The front of the sole seemed to be coming off. These were my Korkers,less than a year old. The bottom front was coming off, this kept the felt sole from staying attached. This irritated me but I still figured I could walk with one felt sole and the rubber on the other boot. When I stepped in the water and slipped a little on the rubber sole side, I thought "this is a bad idea." I made my way carefully upstream, tap dancing here and there. I made a few casts untangled my leader which was way too long. I wanted to make sure I had plenty of tippet so I tied on about 10ft of it. I felt like such an idiot. Fishing with a 18ft leader. Talk about hard to cast with a dropper, it was ridiculous. I went with a caddis and a black stonefly as a dropper. The leader was so long I snagged the stonefly on the bottom every third cast. Combine this with me slipping and my REEL FALLING OFF, I was not a happy camper. Why does my reel always fall off? I used to make so much of a fuss about people paying a lot on equipment. Now I realize there is something to that. You might have spent a lot for a reel but I bet it doesn't FALL OFF while fishing. It's so annoying to do two false casts hear a PLOP! Then see your reel go down stream. While walking up to unsnag my stonefly I slipped and did something I haven't done in my illustrious fishing career. At least not since I've labeled myself as an adult. I started to slip and I was like this isn't good. Of course I slipped on the rubber sole side, I knew I was hitting the water but didn't know how this was gonna go. The water was about 3ft deep and half of my body went under. My head actually almost went in as well. This was the worst I have ever fallen while wading. The cold water shocked me and I cut my hand stopping myself on the sharp rocks. The whole ordeal made me want to just call it a day and pack up. No way I was doing that though. I'm in Boone, I drove to far to just pack up after 10min of fishing. Plus I knew this is my normal scenario of learning things the hard way. I need to slow down take my time and be more careful. I worked my way fishing up stream going here and there. Eventually I came to a fast section where I caught a trout. It's the one in the picture at the top of the post. I've decided I'm not going to post pictures anymore of fish I catch. The reason being it is such a pain to get everything together. Unless I use a different camera it takes about 2min from fight to picture. I feel bad for the fish and this one I'm sure got away fine. It was just annoying to hold him and stress him longer than was needed. 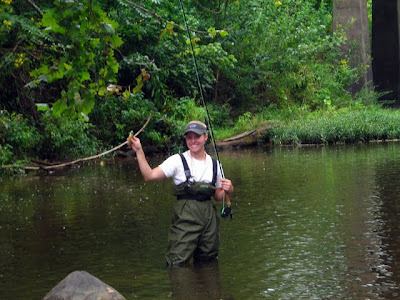 I kept fishing moving further upstream, that fish would be my only trout for the day. The Watuaga is a strange river. I guess all rivers are similar, I'm just not used to fishing them. What's strange is how the fish species will change drastically with the seasons. 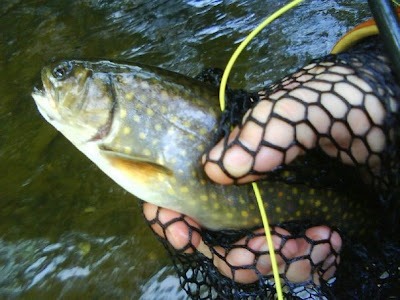 In the spring, fall and winter months, the water is mostly trout water. 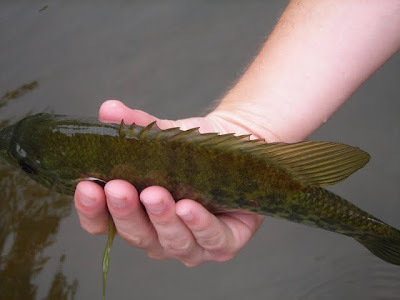 You see suckers occasionally but you never see a large or small mouth bass, or blue gill and rock bass. 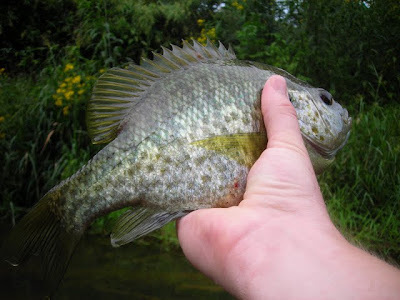 In the summer every slack water pool seems to have rock bass in it. Where are these fish in the colder months? Do they migrate? I'm not really sure but it's fun to catch different fish. 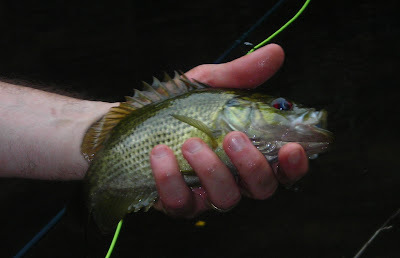 I caught a couple rock bass then came to a slow slack water section full of sediment and slow deep water. Definitely not trout water but perfect for gills and bass. 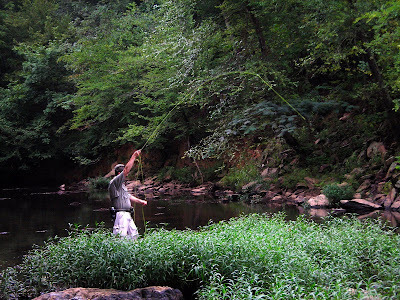 I cast toward some foliage near the bank with a popper. Made a twitch and WHAM, fish on! The fish was large but I could tell it wasn't a trout by it's flash beneath the surface. 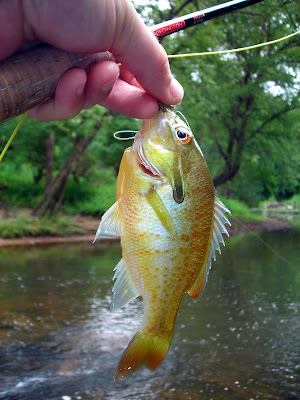 As it came closer I saw a shimmer of the golden under belly, it was a beautiful sunfish. 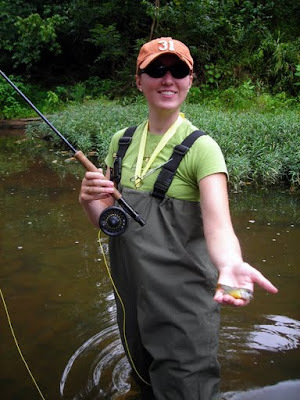 I'm not sure if it was a sunfish or some of the gill species that only inhabit the Appalachian. Either way it was one of the prettiest bluegill I have ever caught. I wanted to take a picture but after the last fiasco I decided to just let it loose. I think the fish was appreciative. It was a great day even with the disturbing beginning. Here are some nice links I found about setting up droppers and explanations on how fish see. Tried Pilot again last weekend. A buddy from work came with me. It was his first time climbing outside. He did really well. We did a lot of 5.6-5.7 routes. By about 11am the weather was getting so hot it sucked the life out of you. I also took about 5 falls off of a route I did cleanly last week. My husband is going to kill me. I was able to make it up, but really struggled about half way through. 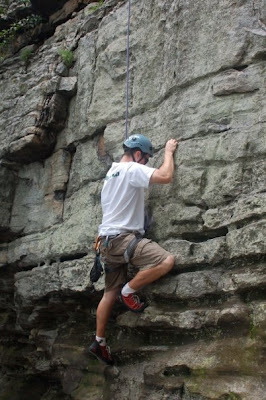 Here's a movie of me climbing Grandpa's Belay. The movie is titled wrong. My wife let me get away for the day to climb at Pilot Mountain. I think it's been a year since I've been here last. The weather was warm and humid but actually a pleasant day. The hike down to the wall was pleasant. The forecast called for a day in the 90's. There was a nice breeze and it pretty much stayed in the 80's. A friend was nice enough to show me some anchor techniques. We actually repelled off the anchor I tied. I was really proud of myself. After getting schooled it was time to get ready to climb. It's amazing how much stuff you pack in. 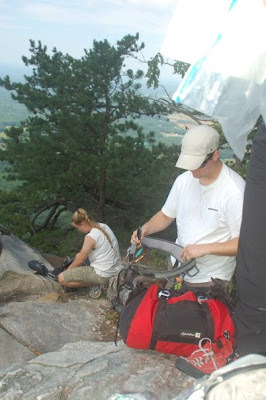 The first routes we climbed were in the Little Amphitheatre section. 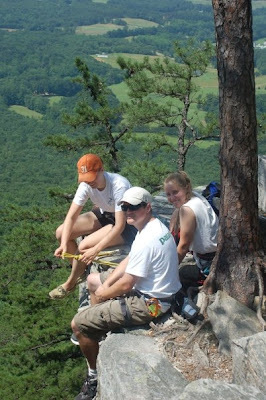 We did Dirty Rotten Scoundrel, Place your Bets and Grandpa's Belay. 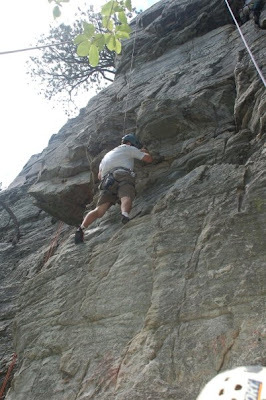 The climbs were 5.6-5.7. Really fun to start the day. One of the cool things climbing is how you meet people We met another group climbing with a guide, and as what often happens we shared ropes. 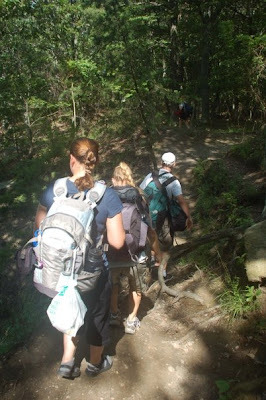 This helps you get more climbs in and it's fun to meet new people. We moved to another section called black rain. I started a route called, My Wife's Gonna Kill me. 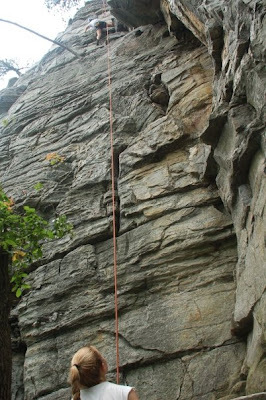 I was able to get up that, but I failed on a 5.9 route to the right called Black Rain. I took a nice 10ft drop and bruised my heel. I think the fall and the route kind of psyched me out. Definitely doable. I'm looking forward to trying it again next time. I only got really 4 climbs in, but I did them all cleanly. I found places to rest where I didn't hang on the rope. It was a really fun day.